And to St' Paul's View Studios in Lindos St Paul's Bay is named after the monastery (still stands) that was built when St' Paul landed there at 51AD. St Paul's Bay is just a minute walk from the accommodation. Its a beautiful bay with 2 sandy beaches, one is organized with sun beds, umbrellas & a snack bar, the other is a very small beach with a canteen. 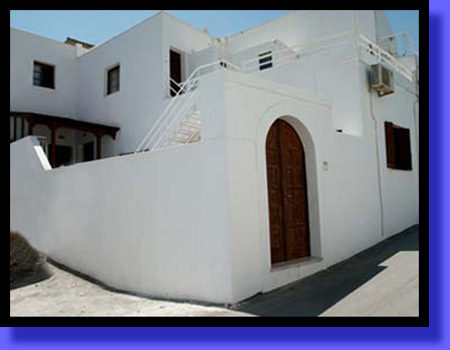 ''St' Paul's Studios'' These studios are situated in Lindos, just 1 minute walk from St' Paul's bay, 10 min. to the Main beach, and about 3 minutes walk from the centre of the village. There are 2 peaceful studios, one ground & one on the first floor, both with beautiful views of St' Paul's bay (if your lucky and your here when there's a full moon you'll see the moon rising from the sea, so red, you haven't seen before).